HairLine kauplus kesklinnas asub nüüd Roseni 12! Jaguar käärid CJ4 Plus 5,5"
Offset design for ergonomic handle position and relaxed working. Angled thumb ring for a very relaxed working posture, without pressure marks. 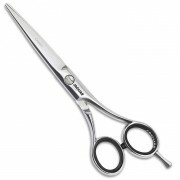 JAGUAR Ocean Hairdressing Scissors,silver line scissors from Jaguar with a short thumb and angled thumb ring to ensure relaxed working position with hollow ground slightly convex blades with partially intergrated cutting edges, making them ideal for slicing. Jaguar fileerkäärid ES Ocean 32 6"
32 thinning teeth with fine V-teeth serration for a pleasantly smooth feeling and a precise cut. 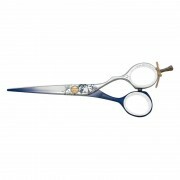 Classic design for a traditional feeling during cutting. Jaguar fileerkäärid ES Diamond CC28 5,5"
28 thinning teeth with fine V-teeth serration for a pleasantly smooth feeling and a precise cut. 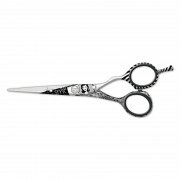 Classic design for a traditional feeling during cutting. 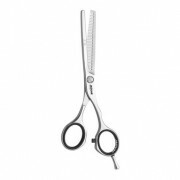 Jaguar Scissors Diamond E 5,5"
JAGUAR Diamond E Hairdressing Scissors, made from forged stainless steel with an ergonomic handle position for great comfort and angled thumb ring to give you a great and comfortable cutting position. 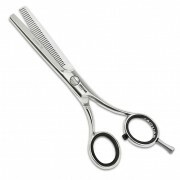 The blades are convex with fully integrated cutting edges, making these scissors ideal for all cutting tecniques. 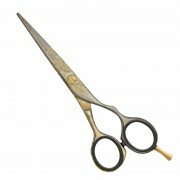 Classic design for a traditional feeling during cutting. 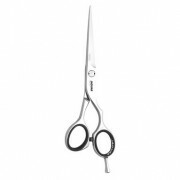 Jaguar käärid Glam Rock 5,5"
Jaguar Art Glam Rock Hairdressing Scissors, stylish offset design scissors with ergonomic handle position for relaxed working, as well as protection for those with nickel allergy. 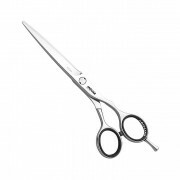 These White Line Jaguar scissors also feature hollow grinding and honing of both cutting edges for optimum slicing and cutting action. 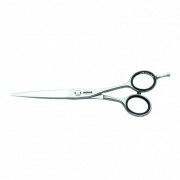 Jaguar Whiteline JP 10 is a great scissor Jaguar. 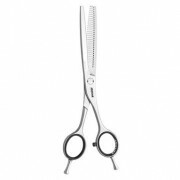 This shear has an offset design and an ergonomic handle for a comfortable and relaxed posture. Jaguar JaguArt Scissors Ahoy 5,5"
The Jaguart Ahoy 5.5" is part of the Jaguar White Line of scissors and features a sailor on the blade. It's design is offset, and offers protection for those with a nickel allergy. The blades have a flat cutting edge which makes them very sharp and they've been honed and hollow ground, making them ideal for slice cutting. The blades are joined by Jaguar's VARIO screw system which is adjustable using only a coin (no need to hunt for a special tool). 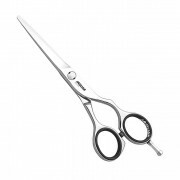 The scissors is forged from Fridour ice-tempered stainless steel which gives it durability and a longer lasting cutting performance. 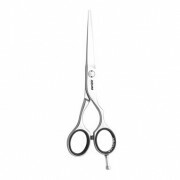 Jaguar JaguArt Scissors Black Patty 5,5"
Innovative, durable high-tech coating for individual, unmistakable scissor design. Protection for those with nickel allergy. Offset design for ergonomic handle position and relaxed working. Hollow grinding and honing of both cutting edges for good slice cutting and outstanding cutting action. 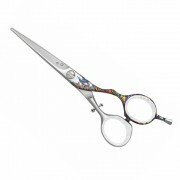 Jaguar JaguArt Scissors Freak 5,5"
The Jaguart Freak 5.5" is one of the new deisgns in the JaguART body collection and features a Tattoo pattern. It's design is offset, wich gives you an ergonomic handle for more relaxed work and offers a protective coating for those with a nickel allergy. The blades have a flat cutting edge which makes them very sharp and they've been honed and hollow ground, making them ideal for slice cutting. Jaguar's unique VARIO screw system joins the blades, which is adjustable using only a coin (no need to hunt for a special tool). 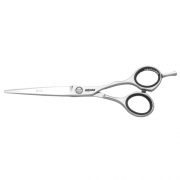 The scissors is forged from Fridour ice-tempered stainless steel which gives it durability and a longer lasting cutting performance. JAGUAR Charm Hairdressing Scissors, features offset handles with a smooth profile and a removable finger rest for a relaxed, classic action. The blades have a flat cutting edge which makes them very sharp and they have been honed and hollow ground, so they’re ideal for slice cutting.it also features a vario screw system which is adjustable using only a coin. Made from high quality steel and ice-tempered to give it durability with a polished finish. Jaguar fileerkäärid Charm 38 5,5"
With its 38 teeth, the Jaguar Charm 38 gives a medium-light cut and with each tooth having a fine, V-shaped serration, you can be sure that the hair won't slip on the blade and each cut will be ultra precise. The blades are forged from ice-tempered high quality steel which gives them excellent durability and ensures a gleaming, polished finish. They're held together by Jaguar's VARIO screw system which can be adjusted with just a coin. 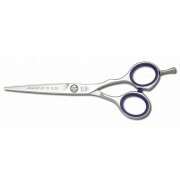 The handles are offset for comfort and feature a smooth profile for a more traditional feel when cutting. The Jaguar Charm 38 Thinner is 5.5 inches long. Jaguar fileerkäärid ES JP38 5,25"
38 thinning teeth with fine V-teeth serration for a pleasantly smooth feeling and a precise cut. Offset design for ergonomic handle position and relaxed working. 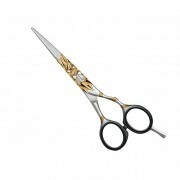 Jaguar käärid Gold Leaf 5,5"
Jaguar Art Gold Leaf Hairdressing Scissors, stylish offset design scissors with ergonomic handle position for relaxed working, as well as protection for those with nickel allergy. 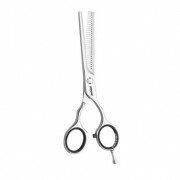 These White Line Jaguar scissors also feature hollow grinding and honing of both cutting edges for optimum slicing and cutting action. HairLine kaubavalikust leiab enda iluarsenali kõik vajaliku nii iluproff kui kõige nõudlikum klient! 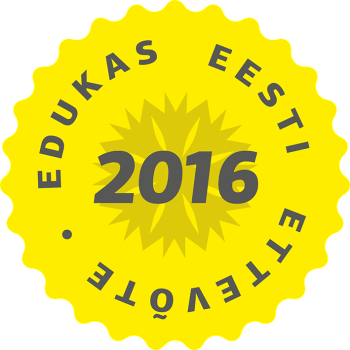 Liitu HairLine e-poe heade pakkumistega.